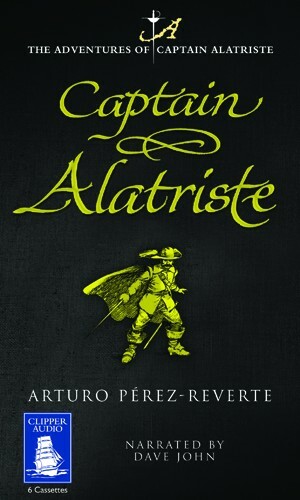 Captain Alatriste is a soldier, now forced to earn a poor living by hiring out his sword. Such is life in Madrid in sixteen hundred and twenty something in the reign of Philip IV. The narrator of CAPTAIN ALATRISTE is Inigo the son of a friend of Alatriste who did not survive one of the many campaigns of the time. Inigo was entrusted to Alatriste's care at the age of thirteen and is looking back over a number of years to tell the tale that occurs in this, the first part of the adventures of Captain Alatriste. Alatriste is referred to a well-paid job by his old army friend, the high constable, Martin Saldana. When he arrives at the dead of night to meet his employer he's joined by another sword for hire, one with an Italian accent. The employer turns out initially to be two masked men and they hire the pair to injure and rob a pair of Englishmen, Messrs Thomas and John Smith, who are known to be shortly entering the city. However when one of the masked men leaves, he is replaced by the terrifying Dominican priest, Fray Emilio Bocanegra, president of the Holy Tribunal of the Inquisition. His orders are very different. The two swordsmen are to kill the Englishmen. When the night arrives, the Italian and Alatriste engage the Englishmen in a fight and the Englishmen are swiftly at a disadvantage. However when one pleads for the life of his friend rather than himself, Alatriste has a change of heart and allows the men to live and by doing so, he makes a mortal enemy of the Italian. Alatriste's decision makes his life forfeit and it appears to be just a matter of time before an accident or execution befalls him and the situations he gets into become more and more difficult to escape. CAPTAIN ALATRISTE is an entertaining glimpse of life in seventeenth century Spain and the attitudes, living standards, morals and not least the wars of the time. The fictional Alatriste has interactions with a number of people who lived at that time, including a brief appearance from Valazquez. The plot is slight but there is atmosphere and action aplenty told in exquisite prose. The only thing I had a slight problem with was keeping the names of Alatriste's group of friends straight. The names being long and unfamiliar, however it didn't spoil my enjoyment of the story. Narrator Dave John gives a splendid performance, and is confident with the Spanish names and terms.